Our Mission outreach is accomplished both corporately by member groups and by individuals and their personal commitment to efforts to serve the Lord locally and globally. Northside tithes (that is, gives approximately 11%) of its operating budget to mission projects each year. The Mission Committee meets the second Sunday of each month and encourages the congregation to contact committee members at any time to share possible mission outreach opportunities. You are also invited to attend our meetings and volunteer to be a part of the committee or to support any of its projects. 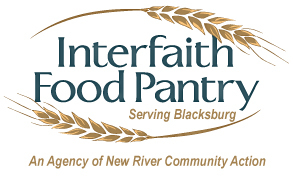 We have an on-going food collection for Blacksburg Interfaith Food Pantry. Northside volunteers are responsible for the food pantry operation two days each month. Using the Kroger Community Rewards Program allows you to use your Kroger Plus card to help us raise monry for milk purchases at the Food Pantry. But first you need to enroll your new or existing Kroger Plus card to Northside's Community Rewards account. To do so, follow these instructions..Go to www.kroger.com/communityrewards to enroll. You will have to sign in or create an account. Once you have done that you can enroll your card with Northside. Northside's account number is 83566. 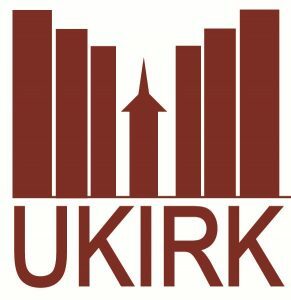 Northside members volunteer to serve on the Ukirk Board. We also recruit volunteers to provide a home cooked meal ("Feed The Flock") to the Ukirk Ministry students at Cooper House once each month during the fall and spring semesters. 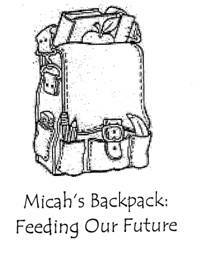 Micha's Backpack program addresses childrens hunger issues by partnering with local schools, corporations, Virginia Tech, and churches to provide direct assistance to students and families who qualify for the free lunch program. 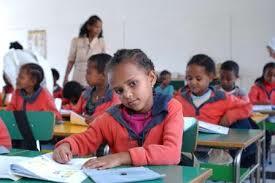 Each week during the school year, the identified students receive a backpack filled with enough food for the weekend. As has been the case for many years, Northside was the collection point in Blacksburg for new and used goods for the Montgomery County Christmas Store. Numerous church members contribute time accepting items at the church and delivering them to the Store. 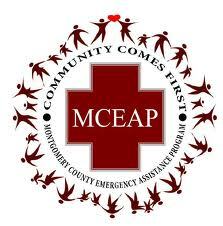 The Montgomery County Emergency Assistance Program assists families and individuals in immediate, temporary, and emergency situations. Their efforts are coordinated with the major local social service agencies and with area civic and religious groups in serving those who do not qualify for other public assistance or have exhausted their benefits. CEDEPCA is an educational institution that contributes to the transformation of lives and contexts by providing training and accompaniment, and by offering spaces for reflection to women and men from diverse Christian traditions, communities, and contexts. The goal of the Valley Interfaith Child Care Center is to create high-quality, affordable, educational, and nurturing care for very young children (ages 0-5) of income-eligible working families in the New River Valley. The focus of EREP is to bring educational opportunity to remote areas that do not have a school within walking distance of small children. Contact Ms. Mary Rhodes for more information. NRV Cares is a private non-profit organization dedicated to protecting children from abuse and strengthening families through education, advocacy, and community partnetships. Presbyterian Children's Home of the Highlands is a residential childcare provider. They provide an atmosphere of love and concern that enables the child to grow and mature physically, spiritually, emotionally, mentally and socially. They also understand that the childs ties to his or her family are strong and therefore work to form and strengthen a bridge between the two so that hopefully the family can eventually assume its rightful place in the childs life. Since 1919, the Home has been caring for abused, neglected, and battered children in the Appalachian Region of Virginia. To Our House (TOH) is a group comprised of interested citizens, human and social service providers, and interfaith ministers and congregations working to provide winter shelter for single adult men. Cub Scout Pack 56 is sponsored by and chartered to Northside. We provide a meeting place, leadership, and some financial support to the scouts.